This week I present a variation of my cluster stitch bag that I made recently. 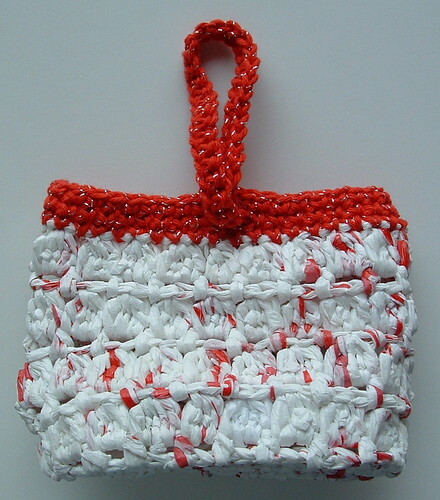 The main body of this bag is crocheted using recycled plastic bags that have been cut into plarn using the looping method. I have a picture tutorial here for making plarn from plastic bags should you need instructions. Just click on the green link. I wanted to add a gift bag type closure to the original pattern to create a reusable gift bag. I used some Christmas cotton to top this plarn bag and created a looped handle to finish off my little gift bag. The looped handle works wonderfully for closing the bag. I plan on crocheting several of these bags to use for gift bags for Christmas. They work up quickly and with the looped handle, you have a ready-made gift bag that doesn’t even require a bow. Special thanks to Helen over at CrochetN’Crafts who was my inspiration for this project. So grab a few of those plastic bags laying around and whip yourself up a beautiful recycled gift bag for Christmas! Beg Cluster: Ch 2, (Yo, insert hook into sp indicated, yo and pull through, yo and pull through 2 lps on hook) 4 times, 5 lps on hook, yo and pull through all 5 lps, Ch 1. Cluster: (Yo, insert hook into sp indicated, yo and pull through, yo and pull through 2 lps on hook) 5 times, 6 lps on hook, yo and pull through all 6 lps, Ch 1. Ch 1, Sc in ea st around and join with Sl St into Ch 1 beg. Ch 1, Hdc in first st, Ch 1, sk next st, *Hdc in next st, Ch 1, sk next st, repeat from * around and join with Sl St.
Sl St into Ch-1 space, work Beg Cluster stitch and then work Cluster in each Ch-1 space around and join with Sl St.
Sl St into space before next Cluster, Ch 1, Hdc in same sp, Ch 1, *Hdc in next sp, Ch 1, repeat from * around and join with Sl St.
Repeat rounds 6 and 7 until you have four rounds of cluster stitches. Make sure your last row is round 6. Leave last st on hook to begin handle round using regular yarn. Using H hook, attach red yarn by slipping into last plarn st. Ch 1, Sc evenly along top edge of bag. Join with Sl St to top of Ch-1 beg. FO plarn where you did last stitch with it. Ch 1, Sc in ea st to center front of bag, Ch 38, Sk one st at center front, then Sc in ea st around to other side’s center. Ch 3 at center of this side for the loop for the handle, Sk 2 sts and Sc in ea remaining sts of round. Join with a Sl St to Ch-1 beg. Check your work to make sure the back opening and handle matches the front of bag. Adjust your sts as needed to match each side to each other. Ch 1, Sc in each st of bag around to handle. Work Sc into each st of chain of handle, then Sc around in each st of bag until you reach loop for the handle on other side. Work 3 Sc around the chain of the handle loop, Sc in ea remaining st of round and join with a Sl St into Ch-1 beg. FO. Thanks for this great article, I personally LOVE how the gift bag worked out. I’ll try to make something similar to it and add a picture here when I finish it. Keep up the work with the articles, a lot of people read them daily. I have made a few of your patterns and I am totally hooked on the whole recycle and making plarn! I have a blog about handbags, http://jaynesaidbags.blogspot.com/ that I am currently working on and I would love to have your permission to incorporate a link to your site for those who are interested in well written, and unique ideas for recyclying items into totes, handbags, purses and such. May I please have permission to add a link to your site on my blogspot for those who might want the great detailed instructions, and ideas you have here for recycling things into handbags. No copying patterns or anything, just a link to your site and a few words about the wonderful work you do. Please let me know. 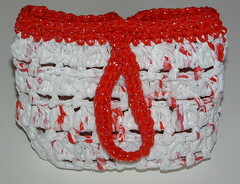 By the way, your lining tutorial and email really helped with putting the lining into my “plarn handbag.” Thank you! @Jayne — I would love for you to link back to my site from your blog. Links to my site and patterns are always greatly appreciated. I’m so glad I could help you with the lining tutorial for your recycled handbag. Best wishes and happy New Year to you too.